Velvet Paw Creations: "Let Love Fly" ATC - Valentine's Week project #3! Now for my 3rd project made for the event! Featuring Lost Coast Designs Cracked Chicken, Grunge Border 2", Hearts and Curls border, Hearts border, "Love and Fly" from the Misc Words set and "Let" is handwritten. I started out by applying Fired Brick and Shaded Lilac Distress Inks to white cardstock with foam applicators, cut out the ATC and then stamped the Hearts border and Grunge Border in Fired Brick, making sure the Heart was prominen. I then stamped the Hearts and Curls border 4 times along the bottom edge of the ATC in Shaded Lilac DI. 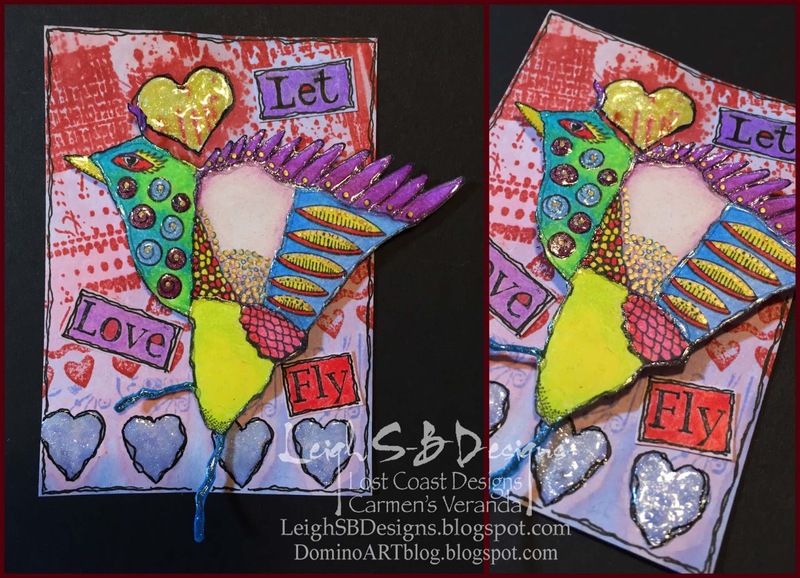 The "Love and Fly" text was stamped with black Versafine onto a piece of scrap background and I handwrote the "Let" word to match the others with a black Micron pen. The Cracked Chicken was stamped in black Versafine Ink and I coloured him, the text blocks and the background heart with PrismaColor pencils and included some metallic gold details. The Cracked Chicken was fussy cut out and adhered to the ATC with pop dots. For yummy dimension and sparkle I applied Vive Pearl Magic Transparent White pen to the chicken and all the hearts. Stop by again tomorrow for my 4th project and I hope I've inspired you to pop over to the Portal and join us for Valentine's Week!